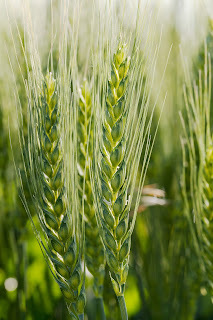 "Shelly" wheat is the newest variety from the University of Minnesota's hard red spring wheat breeding program. "Shelly" is the newest wheat variety developed by the University of Minnesota and dates for touring demonstration plots have been announced. Released in January, 2016, Shelly is a high-yielding spring wheat variety well suited for much of the spring wheat-growing region. "Shelly is a nice compliment in the strong University of Minnesota line-up of HRSW cultivars and replaces Norden in the top yield segment," says Jochum Wiersma, University of Minnesota Extension agronomist. "It is a strong contender to replace both Faller and its sister line Prosper, which together have accounted for roughly a third of Minnesota’s wheat acreage in recent years." The new release is named after the town of Shelly, Minn. , which is on the west side of Norman County, near the Red River and in prime wheat growing country. Shelly is home to the Red River History Museum, located in Shelly's 1930s Art Deco school and run by the Norman County Historical Society. Shelly plantings can be previewed July 20 during field days at the University's Northwest Research and Outreach Center (NWROC), Crookston. Plots of Shelly and competing varieties are also at on-farm trials at the following Minnesota sites, with two-hour tours scheduled for five of the sites on the days listed. University of Minnesota experts will provide information relevant to the current growing season and answer questions. Bring samples from your fields for diagnosis and discussion. Shelly joins several other recent University of Minnesota spring wheat varieties; Bolles (2015), Linkert (2013), and Rollag (2011). They offer growers a good combination of strong characteristics and perform well across the upper Midwest. More detailed performance data and comparisons of previously released varieties can be found on the Minnesota Agricultural Experiment Station website at www.maes.umn.edu. Prior to being formally named, Shelly was tested as MN11325-7. Researchers at the University of Minnesota have been evaluating and developing wheat varieties since 1889. "Shelly" will be distributed through Minnesota Crop Improvement Association members with seed available for planting in spring, 2017. Visit the MCIA website - www.mncia.org - where a list of Certified seed producers will be available in September. Or contact MCIA at 1-800-510-6242.